Top 8 Star Wars: Galaxy's Edge Experiences We're Most Excited For! As the date gets closer, the past few weeks have been a windfall of new information as Disney releases many details we’ve been waiting for as we look forward to this expansion of galactic proportions. We found out that the land will first open with only the Millennium Falcon: Smuggler’s Run being fully operational- the Star Wars: Rise of the Resistance attraction will open later this year. And that’s really all we know for that second release date, Disney has just said later this year. So that is something to keep in mind for fans planning their vacation for Star Wars: Galaxy’s Edge. To stay up to date on everything related to this new land including FastPass information, news releases, tips and more be sure to bookmark our official Star Wars: Galaxy’s Edge guide. Based on what we know at this point, coming from an avid Star Wars fan, these are the top eight things to look forward to at Star Wars: Galaxy’s Edge! Plan Your Vacation to Star Wars: Galaxy’s Edge! This attraction comes in at number one on my list because I am literally about to keel over in anticipation! I’m hoping, along with everyone else, that this ride will be ready shortly after Galaxy’s Edge official opening date so we can experience it this summer. It’s also understandable that this attraction is delayed due to the revolutionary nature of this larger than life experience. Star Wars: Rise of the Resistance will be a 28 minute long experience beginning with an assignment from Star Wars favorites like Rey and BB-8 to join a mission to fight the First Order. From there, guests will be outside walking past Poe’s X-Wing on a flight deck and you will board your star ship. Things appear to go well before you get sucked into a Star Destroyer, taken prisoner and led on an escape from the grasp of the Fist Order. The press previews confirmed that this ride is really four attractions in one! 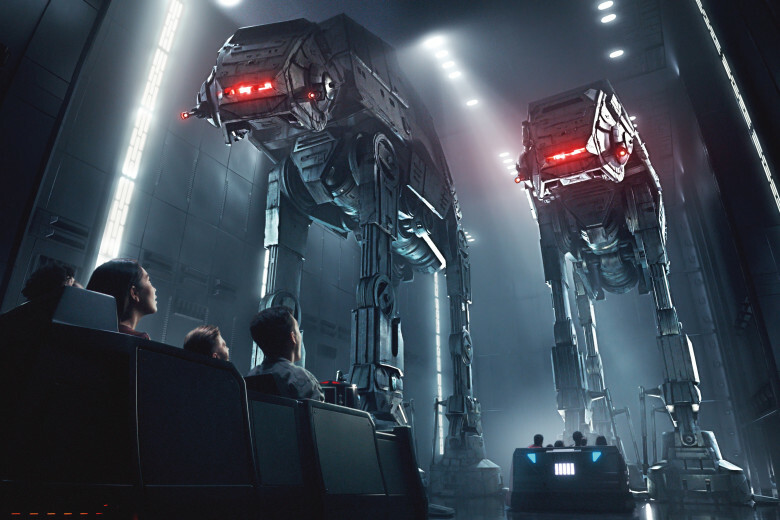 For the first time a Disney ride will move you from experience to experience in different vehicles and different segments to really capture that immersive feel of being caught between a battle between the Resistance and the First Order. I may become a First Order sympathizer after this experience! And at number two, we have the other brand new anticipated attraction coming to Star Wars: Galaxy’s Edge! The Millennium Falcon: Smuggler’s Run will allow guests to board a realistic scale sized Millennium Falcon and explore the ship before taking the fastest hunk of junk in the galaxy for a spin. This experience is similar to other attractions in the park like Toy Story Midway Mania that offers a game experience during the ride. The game of choice here is taking the Millennium Falcon for a spin and trying to smuggle your way successfully through the galaxy! There will be various positions and based on where you end up on the ship will determine your role. Your success with the mission will impact your immersive experience in the land if you are connected to the Play Disney Parks app which is another incentive to avoid those bounty hunters. This is the first ride that is opening with Star Wars: Galaxy’s Edge’s and I cannot wait to board the ship that made the kessel run in less than 12 parsecs. This is the first ride that is opening with Star Wars: Galaxy’s Edge on May 31st at Disneyland and August 29th at Walt Disney World. To read more about these attractions, view preview clips, and new press preview photos click here. This is where you will go to tend to your lightsaber needs at Star Wars: Galaxy’s Edge! This will be more than just your typical souvenir outing but an immersive experience of Jedi inspired self discovery. A workshop Master will lead guests through the process of customizing and building their own lightsabers as they teach them the ways of the Jedi. Guests will choose four disciplines: Power and Justice, Power and Control, Elemental and Nature, or Protection and Defense. Once they have chosen their discipline, they will then choose their kyber crystal. 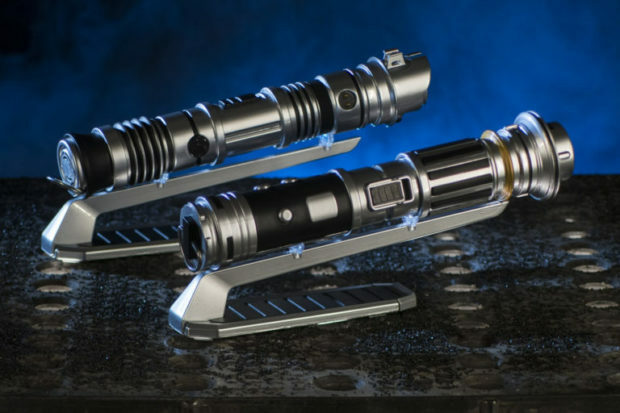 Once completed with that, the Master will give guests a set of 10 lighstaber pieces to combine so guests will leave with their own custom lightsaber. Recent press previews have revealed that this store can only hold up to 14 people at a time and will be a 15 minute long experience. From the description provided by Disney and the recent press reviews, this sounds reminiscent of the wand experience at Ollivander’s at the Wizarding World of Harry Potter inside Universal Studios. Considering how successful that is over in the world of Harry Potter, it’s a smart move on Disney’s part to incorporate that similar immersive edge into this corner of the galaxy. Besides Savi’s workshop, there will also be merchant shops to build your droid, adopt Galactic creatures, and show your allegiance to the First Order or the Resistance with authentic clothing. So far the information coming out of Star Wars: Galaxy’s Edge on the new Audio-Animatronics is that they will be some of the most impressive technology ever used at the Disney Parks. Or at least, to rival some of the amazing advancements we’ve seen in animatronics like at The World of Avatar in Walt Disney World. There are many animatronics spread throughout the land but the most highly anticipated is that of Star Wars fan favorite piriate Hondo Ohnaka from the animated series Star Wars: The Clone Wars and Star Wars Rebels. Guests will see him waiting in the control tower in the Millennium Falcon: Smugglers Run attraction ready to direct guests on their smuggling mission. “Remember,” he tells guests in the queue. “The more you work together, the more you earn. Your lives — and my profit — depend on it! Press previews have all made clear how impressive the technology is for this guy making him one of my must see animatronics in the land. To read more about all the characters you will encounter at Black Spire Outpost, click here! One of the things that will make Star Wars: Galaxy’s Edge unique is that this land will aim to be a completely immersive experience. It has been designed that once you step into the land, you will feel like you have really landed on the planet Batuu and are off to visit the village of Black Spire Outpost. You won’t see t-shirts with ‘Star Wars’ on them, for example, or Coca-Cola bottles being displayed for sale. Everything from the merchandise to the food to the Cast Member attire will be themed with the land itself. The Play Disney Parks app will play an active role in helping guests feel at home in Batuu and craft their own storytelling experience. The land has been designed to be highly interactive allowing guests to find hidden crates and containers, play in-queue games, message characters, and participate in land specific missions. The experience within the app will constantly update and change offering guests new experiences with each visit. And no, there is no WIFI needed! You cannot have a Star Wars themed land without blue milk! 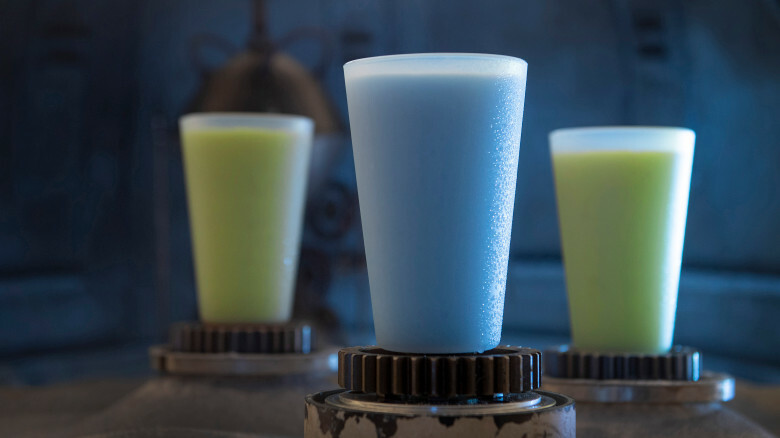 This famous Star Wars drink will be offered in the land at the Milk Stand along with the green milk you also see Luke Skywalker drinking in The Last Jedi. Disney has already said this isn’t actually a milk product and is instead made from plant based materials. Insider information has said it will have a smoothie like consistency. Be right back, getting in line now! 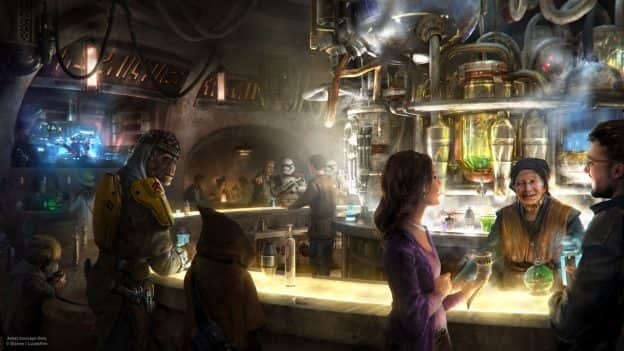 Oda’s Cantina was one of the first details we received about the dining options available at Star Wars: Galaxy’s Edge and it made headlines as being the first place to sell alcohol inside Disneyland. That is not the only remarkable part of Oda’s Cantina, the atmosphere is said to be similar of Tatooine’s Mos Eisley Cantina from Episode IV: A New Hope. Rex, the robot pilot from the original Star Tours, will entertain guests as the cantina’s DJ with original cantina songs created by composers and songwriters worldwide. 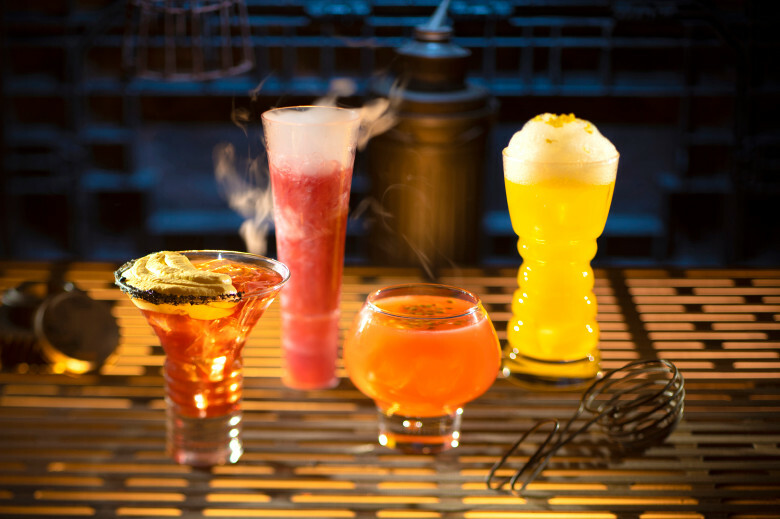 And the drink list that has been released so far offers a variety of cocktails, non-alcoholic drinks, and specialty brews created just for the cantina. You can read more about Oda’s Cantina, the Milk Stand, Docking Bay 7 Food and Cargo, and the other food marketplaces here. The Oscar-winning composer John Williams is creating new and original Star Wars themes exclusively for the land. Star Wars fans will feel right at home as they hear the famous scores of John Williams throughout Black Spire Outpost. But don’t fear, this music won’t interfere with the immersive element the land aims to provide. You won’t hear it just playing throughout the streets of the land- it will be integrated into relevant moments whether that is on the attractions themselves or inside the restaurants or the merchant stores. Great list Lindsay! I am most excited for the Rise of the Resistance attraction, food and beverage, and incredible merchandise. I can’t wait to buy my own REX figure. Mostly bummed about the sale of alcohol in Disneyland. The park and its bathrooms smell better than DCA, which sells alcohol. How do you make a no-cost reservation, subject to availability, to access the land? Disney hasn’t yet announced the detail on that! I would keep an eye on the Disney Parks Blog page as I imagine those reservations will go fast. Guests staying at Disney owned hotels during that tie period will automatically get one with their stay.